The Wiznet chips are arguably the easiest and most straightforward way to get a Teensy, or just about any Arduino compatible development board, on the internet. Ever since the W5100 in the first Arduino Ethernet shield, these chips have been the weapon of choice for most tinkerers. The small-footprint, Wiznet-provided Wiz820io, based on the W5200, proved to be an excellent match for the Teensy, with a handy adapter board by PJRC to go in between. The only downside to the Wiznet chips was their price. A Wiz820io would easily go around €24/$26 online, a price point where you could easily get 6 or more ENC28J60 Ethernet boards for on Ebay. Okay, the ENC doesn’t have the stability of the Wiznet stack (I have W5200 boards running for years now without even a single hiccup), but hey, it’s only €3! I drink beers that cost more! Recently, very cheap Wiz850io boards are appearing on sites such as Ebay and Aliexpress. The Wiz550io boards are built around the W5500 chip, which is an optimised version of the W5200, which in turn is a huge improvement of the venerable W5100. The W5500 has pretty much the same specs as the W5200, but consumes less power and is cheaper, presumably because of higher yields. The Wiz850io is pin-compatible with the popular Wiz820io. 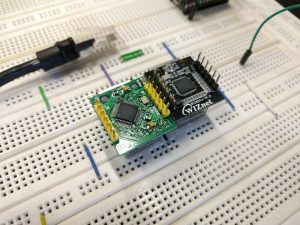 While Wiznet-made Wiz850io boards sell around €14/$15, the Aliexpress ones go for €8 and less. These seem to be ‘China Export’ versions of the Wiznet reference design, but with the genuine W5500 produced by Korean Wiznet. I bought some of these Wiz850io’s to check if they we’re the real deal. Oddly, these boards we’re called ‘Wiz850io W5500 ENC280J60 Ethernet Chip’. And now they’re just called ‘W5500 Chip SPI’. Searching for Wiz850io on Aliexpress even yields no results anymore. Seems like Wiznet cracked down on the use of their Wiz850io product name. Even though they changed names, the products seem to be the same however. I paid €8 per board, including shipping – which took exactly two weeks. 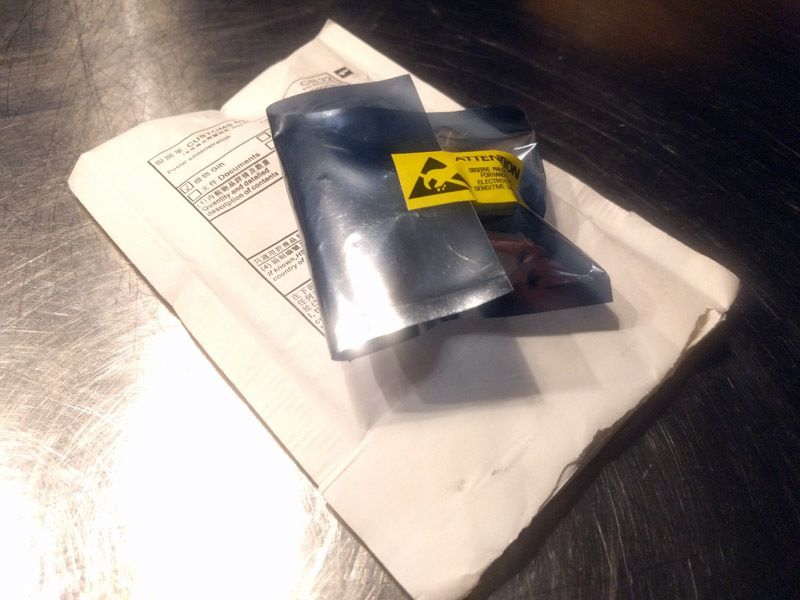 The boards arrived decently packaged in anti-static bags. The form factor was identical to the Wiz820io’s I used until now, as should be. The UDE magnetic-integrated socket was replaced with a HanRun one, reminiscent of ENC28J60 boards. The headers had an unusual yellow color. There was also a red LED below the RJ45 socket. 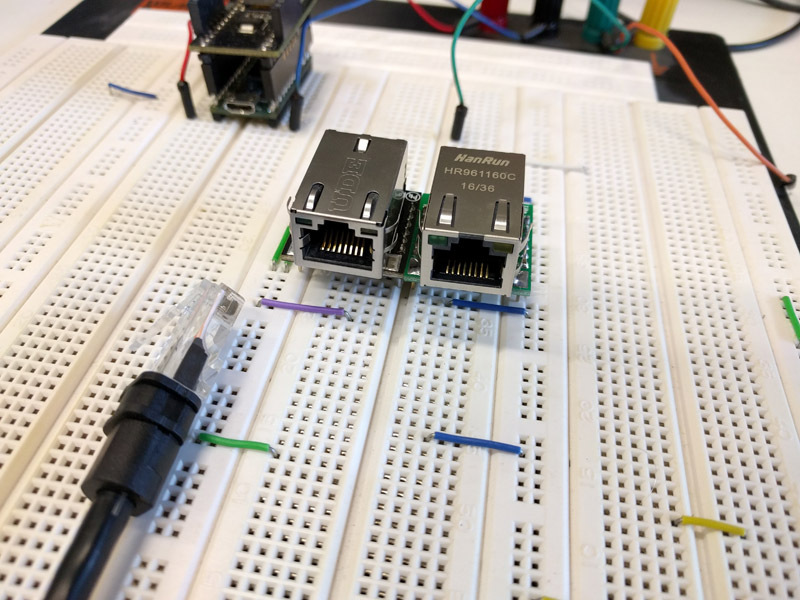 Since Teensyduino 1.32, released for Arduino 1.6.13, the W5500 is fully supported in the Ethernet library. I used the Chinese Wiz850io on the PJRC adaptor board connected to a 100Mbit switch and ran a sketch that assigned an IP through DHCP and then requested HTML pages from the internet, before doing the same test on a regular Wiz820io. Meanwhile I measured the current consumption on the 5V line. Both the regular Wiz820io and the Chinese Wiz850io performed perfect, with DHCP IPs being leased and webpages requested without a problem. 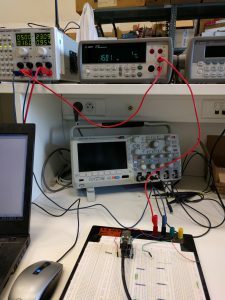 The continuous power consumption of the Wiz850io was around 26% less than the Wiz820io, and was even lower than the no-cable-connected power consumption of the latter. With around 128mA being used, this seems consistent with the power consumption of the official Wiz850io as provided by Wiznet. 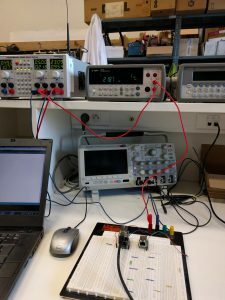 I haven’t done long term stability testing, but so far it seems like these cheap Wiz850io clones are China made versions of the official reference design and are working equally as fine, but saving you a buck or 7.